Great expanses of ice and the Northern lights up above. We developed our ANTARCTICA DOME expedition tent together with polar explorer Arved Fuchs specifically for Arctic nights. The dome design is extra robust and remains completely stable even in a snowstorm. It is designed to accommodate three people plus equipment. The flysheet is made of high-tenacity silicone coated RIPSTOP nylon for extreme durability and waterproofness. 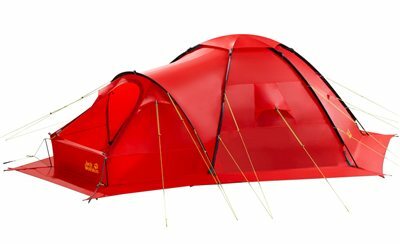 The tent is built to withstand snow loading and heavy, persistent rain. The D-shaped entrance is raised up from the ground to keep out snow, increase the wind stability and allow you to get in and out more easily. The ANTARCTIC DOME features all-round snow and storm flaps.